Dan Bull talks to the small team in an inspiring video. It was almost two months ago we told you about an incoming patch for Scourge: Outbreak, a game we were less than impressed with on Xbox Live Arcade. The team at Tragnarion was committed was committed to updating the game with a bunch of improvements based on community feedback, today that patch is out on Xbox Live Arcade bringing over 60 enhancements. Before we get to the patch notes, we wanted to share a little behind the scenes video created by YouTube Rapper Dan Bull. Apparently Dan is a big fan of the game and wrote a song about it, let's watch that first. Pretty catchy if I do say so myself. It was so catchy that Tragnarion invited Dan to their office to get a behind the scenes look at the game as it launched. The result? An honest look at the team behind the game and their thoughts and emotions as they released one of their first major titles. Even though we may not have thought the game was up to snuff, it's easy to see these folks put a lot of heart, sweat, and love into the game they made. For co-op gamers the biggest update is the ability to play it in the trial mode. You can also earn Xp that'll carry over to the full game if you decide to purchase. 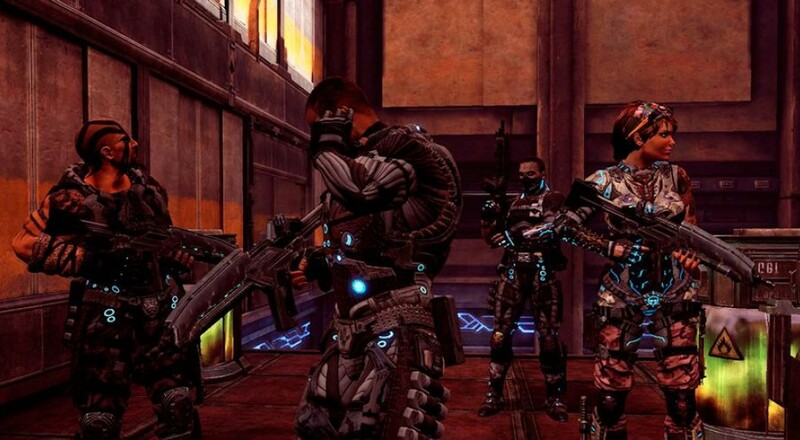 There's plenty of other tweaks for this four player co-op shooter, so read on to find the enhancements. 1.- TRIAL MODE: Now supports Co-op play (same checkpoints as pre-patch). 2.- TRIAL MODE: Versus (PvP) mode available in one map (“Crash”). Playable in Deathmatch, Team Deathmatch and Capture The Flag. Note that Trial players and Full Game players cannot play together. 3.- TRIAL MODE: Players can now earn XP and can level up all four XP categories (Abilities, Assault, Co-op and Weapons) up to Rank 5, thereby unlocking 8 of the 20 Perks in the Trial, usable in Singleplayer, Co-op and Versus modes. This progress is saved, so you’ll keep it when unlocking the Full Game. The “Jack of All Trades” Achievement (Reach Rank 5 in all 4 XP categories – 30 gamerscore) will be earned automatically when unlocking the full game if you have met the criteria already. Same for the “Juggernaut” Achievement (Obtain 6 Awards in one Multiplayer round or one Campaign Level – 40 gamerscore). 4.- TRIAL MODE: All four Echo Squad members are now playable. 5.- TRIAL MODE: All four Trial mode checkpoints are unlocked by default. 6.- TUTORIAL: The first checkpoint after the Tutorial (CP 1.2) is unlocked by default, and is selected by default in the Host Co-op Lobby. 7.- TUTORIAL: Added ‘SKIP AT ANY TIME VIA PAUSE MENU’ text to the existing “SKIP TUTORIAL” message. Note that it was already possible to skip the Tutorial via the menu, but many people were not aware of this option. 8.- VERSUS: Unranked matchmaking now allows joining games in progress. Previously it would only find and connect to games that were still in the Party Lobby. 9.- VERSUS: For Unranked matches, minimum players required to start the match reduced from 4 to 2. Matchmaking will wait 30 seconds after the most recently connected Player (this resets per new player) before starting the match. 10.- SPRINT: All Echo members have more Stamina. 11.- SPRINT: More difference in max Stamina between Shade and Mass. 12.- SPRINT: Lower delay between reaching zero Stamina and beginning to recharge Stamina, and added short delay between reaching zero Stamina and being able to use Sprint. 13.- SPRINT: Made Stamina recharge rate the same for all characters. 14.- ROLL ACTION: Reduced cone angle for detecting/entering cover, so that it is now much easier to avoid accidentally entering cover when rolling near/past an object. 15.- HUD: Grenade indicator now much more visible. 16.- HEADSHOTS: Previously the Enemy AI would play quite a violent ‘stumble’ animation when shot in the head, making it difficult to finish them with quick follow-up headshots. They now play a different animation where the head does not move so much from it’s original position. 17.- All weapon variants with the REFLEX SIGHT now enter Ironsight faster. 18.- REAPER: The Reaper + Grenade Launcher variant is now not selectable in Versus (it was overpowered in PvP). 19.- REAPER: All variants have less vertical recoil and better stability while moving. 20.- REAPER: The Grip/Reflex variant (+STB) has better accuracy. 21.- REAPER: The Ultra variant (+DMG) now fires two bullets per burst (instead of three), but each bullet does more damage. Total damage per burst is the same as before. 22.- FIREFLY: All variants have less vertical recoil, better stability, no longer return to original position after firing (ie. now stays aimed where you were aiming at end of burst) and does less damage per bullet (to compensate the fact that it is now much easier to hit consistently). 23.- FIREFLY: The Grip/Reflex (+STB) and RedDot/Reflex (+ACM) variants have better accuracy. 24.- BARRACUDA: Implemented fixed pattern of pellet distribution, instead of pure random distribution, to improve hit consistency. 25.- BARRACUDA: Changed camera recoil movement so that Mass has less recoil than Shade (instead of the same for all characters). 26.- BARRACUDA: Increased damage for all variants. 27.- MANTICORE: Projectiles no longer drop due to gravity, so they should coincide better with the cross-hair (still not perfectly, but better). 28.- MANTICORE: Character recoil animation is now synchronized with rate-of-fire. 29.- AMP: By default, Amp reloads the Firefly faster than anyone else. 30.- MASS: By default, Mass reloads the Barracuda faster than anyone else. 31.- MASS: Lowered Mass’ accuracy in general, to compensate for improved Accuracy and Dispersal Cone of most weapons, differentiate him from Shade, and encourage Mass players to use high-recoil weapons (which Mass controls better) and at short range. 32.- MASS: Enters Ironsight mode faster than Shade for short-range weapons (Barracuda, Firefly). 33.- SHADE: By default, Shade reloads the Guardian faster than anyone else. 34.- SHADE: Improved Shade’s Dispersal Cone (ie. worst case accuracy when firing in bursts) in general, to emphasize his better accuracy (which at the moment is partially ‘hidden’ by such a bad DC). 35.- SHADE: Shade enters Ironsight mode faster than Mass for precision weapons (Guardian, Piranha). 36.- STONEWALL: By default, Stonewall reloads the Reaper faster than anyone else. 37.- SHIELD ABILITY (ALL): Reduced width slightly. 38.- SHIELD ABILITY (ALL): Perk which increases Shield size now increases by 1.5 instead of 2.0. 39.- SHIELD ABILITY (STATIC): Compared to Shade, Stonewall’s Shield costs more Ambrosia per second, is bigger and drains Ambrosia faster when taking damage. 40.- SHIELD ABILITY (STATIC): Compared to Stonewall, Shade’s Shield costs less Ambrosia per second, is smaller and drains Ambrosia slower when taking damage. 41.- SHIELD ABILITY (DYNAMIC): Compared to Mass, Amp’s Shield costs more Ambrosia per second, is bigger and drains Ambrosia faster when taking damage. 42.- SHIELD ABILITY (DYNAMIC): Compared to Amp, Mass’ Shield costs less Ambrosia per second, is smaller and drains Ambrosia slower when taking damage. 43.- SHOCKWAVE ABILITY (ALL): Shield no longer needs to be deactivated before you activate the Shockwave. Activating the Shockwave while the Shield is active will automatically deactivate the Shield and execute the Shockwave. 44.- SHOCKWAVE ABILITY (STATIC): Stonewall Shockwave cost reduced from 35 to 30. 45.- SHOCKWAVE ABILITY (STATIC): Mass Shockwave cost reduced from 45 to 35. 46.- AMBROSIA: When entering the radius of an Ambrosia source (ie. Ambrosia Cell/Container, teammate, etc), recharge begins immediately instead of after 1 second. 48.- ABILITIES XP FROM SHIELD PROTECTION: Preventing damage (to self or teammate) with Shield now generates XP less more slowly in Versus modes. Previously it was too easy to pump up ABILITIES XP extremely quickly. 49.- Fixed several statistics submission issues when joining a Co-op game in-progress. 50.- Dynamic Shield no longer gets stuck facing the wrong direction after certain actions performed while holding weapons with Assault Grip. 51.- Players with poor network connects will get a loading icon when accepting an invite, to provide feedback that you are indeed in the process of connecting. 52.- Fixed rare bug which could cause Player to re-spawn after vaulting. 53.- Fixed message-box scroll bar not updating correctly during fades. 54.- Fixed problem with Player count not updating correctly (and therefor the slot not becoming available) when a Player leaves the Pre-Game Lobby in a system-link game. 55.- Solved very rare issue with getting stuck on loading screen while loading checkpoints. 56.- Fixed bug where the game logic could get stuck if a Player exits the game while watching a Flashback in Co-op mode. 57.- On some screen formats the HUD’s grenade proximity indicator, way-points and QOS order icons could be outside the safe-region (ie. beyond the screen’s edge). 58.- Fixed various issues with the Invite and Join Game buttons, and Rich Presence issues when traveling between game and lobbies. 59.- Fixed some rare gameplay blockers which could occur when using very specific combinations and sequences of special actions and abilities, such as activating Shockwaves during a 180 turn while coming out of a roll, etc. 60.- Revised some localization messages regarding loss of un-saved progress when exiting the game. 61.- Re-phrased description of ‘Field Medic’ award to clarify that only revived Players count, not reviving AI Squadmembers. 62.- Fixed several death-cam issues in Versus modes. 63.- There are some known visual glitches with the Guardian Sniper rifle, such as non-damaging ‘extra’ shots occurring on clients only when firing rapidly, camera shake not always occurring on clients, etc. We’re working on fixing these issues as quickly as possible for the next update.